Since December 22, many government workers have been suspended from their jobs temporarily due to the government shutdown, making this the longest government shutdown in American history. A government shutdown occurs when Congress fails to fund federal government agencies, fails to pass appropriation bills, or when the President refuses to sign the bills. In this case, President Donald Trump issued the government shutdown due to lack of funding for the border wall. Not only has the shutdown affected workers and their families, but it has affected many citizens who rely on government workers and programs to assist in their everyday lives. “Those who have been able to come to work under tough circumstances have been a great help getting the customers through the checkpoint as soon as possible,”said Lovefield Communication Manager. The government shutdown is now the longest closure in history since the 1995-1996 shutdown which lasted 21 days. The longer the shutdown lasts, the more problems that occur because of it. This year the IRS announced that tax filing season will start on January 28, but because of the shutdown others worry if there will be enough IRS workers to process the tax returns and send out refunds on time. Another problem focuses on food stamps distribution to families who rely on them. Some programs that issue food stamps depend on the government to fund them or to supply them with the food to give out to families. However, due to the shutdown, the programs will not be funded and may run out of money, forcing families to find other alternatives for getting food and assistance. Although news media focuses on government workers, the situation is more dire than many people realize. 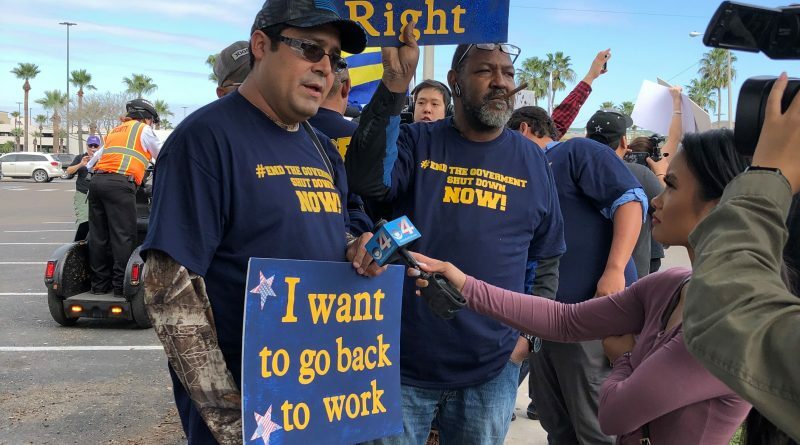 The trickle down effect is seeing hourly workers’ schedules decreased and businesses that cater to government workers are shortening their hours of operation. Protests outside government buildings are increasing across the nation. Airport security lines are lengthening daily with some airports closing entire terminals due to worker shortages. According to the Houston Chronicle, the “TSA close Bush Airport security checkpoint in Terminal C due to government shutdown-linked staffing issues on Jan. 13.” Other national airports are reporting similar problems and urging travelers to arrive 2 to 3 hours before their scheduled flight. A TSA spokesperson told the Houston reporters that “airports in certain locations will begin exercising consolidation options during peak periods. These decisions will be made at the local level.” For now, federal employees have little choice but to show up to work if they are deemed essential, as TSA agents are. A recent Scroll poll asking for shutdown length predictions and who is to blame for the government action, found students believing the closure will continue 3 to 4 more weeks and that President Trump is solely to blame. I am a junior and I enjoy cheering.I want to attend college in New York and major in criminal law. I love writing for the lamar scroll because I like to make others aware of what is going on in our school. September 19, 2018 Naarah Addae Comments Off on Go, Fight, Win!